Road), or potentialprojects (e.g. Al Tayyar Land on Al Nasr Road). The site enjoysstrong connections to Cairo Airport and main CairoArteriessuch as Al Nasr Road (Auto Strad) and Al Orouba Road. 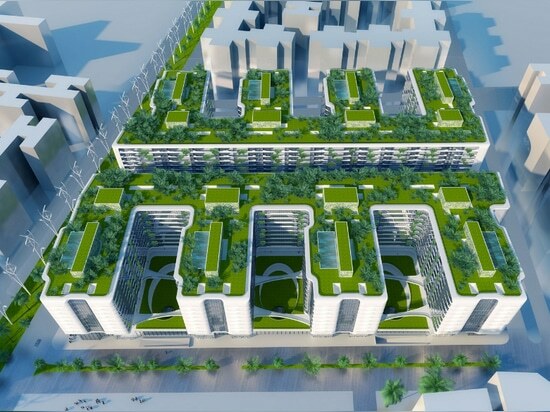 In the heart of this New Cairo, the «Gate Residence» is an innovative design idea of Green Building, representing the combination of Trees and Building and metamorphosing the city into a vertical, green, dense and hyper-connected ecosystem. 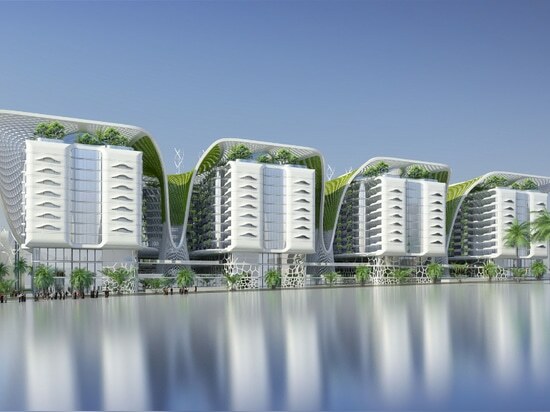 The main objective behind this urban proposal is to raise awareness of green sustainable architecture to fight against global warming in order to maintain an eco-friendly Earth for our next generation. The project shows a high ambition in green energy and technology. 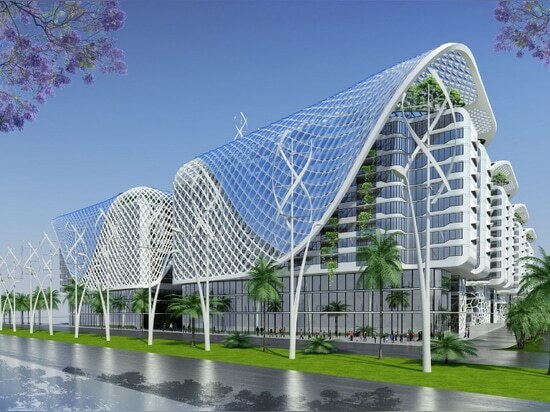 A solar roof covering the shopping area, green terraces and sky villas partially unifies architecturally the whole complex.This roof provides the possibility of maximizing green energy; providing shadow where necessary, thus decreasing the demand in mechanical ventilation. This roof is also the support for the solar panels and solar heating tubes, and for the green vertical gardens. Volumetrically, the «Gate Residence» is organized around a central street named «the Boulevard» acting virtually as the spine of the housing project. The 1000 apartments are organized in rectangular regular buildings, the «U» shapes, attached to the central street. 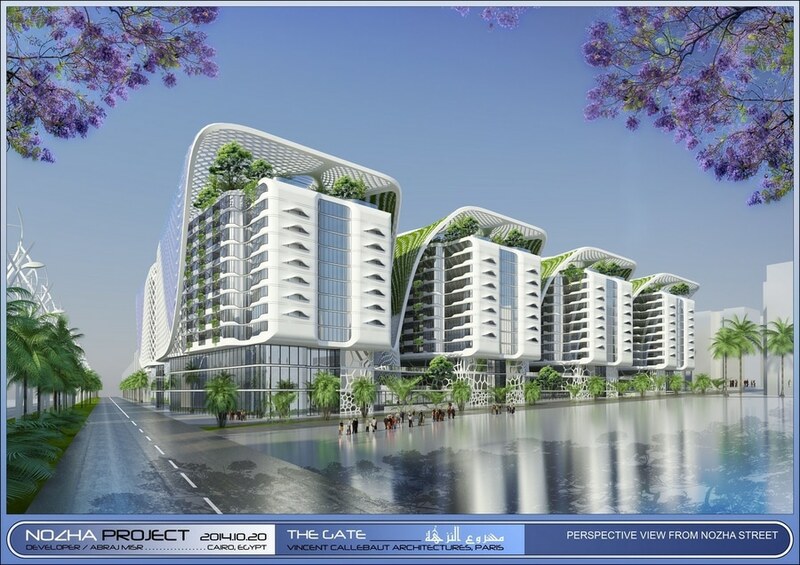 The objective is to create a sustainable landmark in New Cairo by transforming this efficient building mass, multiplying the perspective views towards the streets, into a huge urban oasis.The program provides an underground parking on 4 levels; 1 level of supermarkets, 3 levels of commercial area starting on ground level connected with Nozhastreet, and finally 9 levels of housing integrating 3 levels of offices along the inner street. The building mass is refined by the softening of all the edges of the « U » shapes. The facades of the 9 housing floors are conceived like an horizontal sedimentation of e-low glass and polished white stone.At both ends, the facades are inspired from the gills of fish acting as sunshades. All around, linear hollow joints in steel stretch horizontally all the blocks to keep an elegant global building volume.All the balconies are transformed into suspended gardens by the integration of planting beds along the facades perimeter in order to create green cascades falling in each courtyards. A transparent curtain wall is set all along the Promenade and along the Back Street and the Nozhastreet. This curtain wall is punctuated by green walls indicating the main entrances towards the shopping mall and the lobbies of each apartment blocks.Inside the patios, the facades are developed with a voronoï structure presenting organic shapes inspired by the structure of a coral reef with a progressive density from the bottom to the top. These facades are linked by foot bridges crossing the green terraces. These green terraces inside each courtyards are covered by a voronoï screen for the growth of climbing plants to limit the indiscreet views between the commercial floors and the housing floors. This voronoï screen is also integrated along the inner street between the offices floors and the housing floors. The roof of the whole complex is transformed into a big community garden in the Egyptian sky. The two plots are linked by sky foot bridges. The roof becomes the fifth facade of the project and a common playground area of food gardens, orchards, infinity swimming pools and sports area for all the families living in this project. The ambition of the Gate Project is to create a new prototype of inhabited ecosytemthat combinespassivhaus principles and renewable energy technology to assure 50% of energy saving. The building is designed to decrease its carbon footprint, and to recyclea part of its own waste as the grey water for example. To achieve this goal, a mathematic mesh surface unfolds above all the building volumes as a braided dress. This second skin in white steel and cablesenables to integrate on the roof the photovoltaic cells, the thermal tubes, and the vertical living walls. The horizontal surface of the roof is turned into giant trees in order to down, towards the basement, the loads of the structure. These Megatrees become the strong sculptural identity of the project but are firstly conceived to ventilate naturally all the basement spaces and to refresh naturally the patios and the inner street.Along the Back Street and the Nozha Street, the roof structure becomes a vertical sunshade and a sound barrier to protect the residents from the sun and the noise. 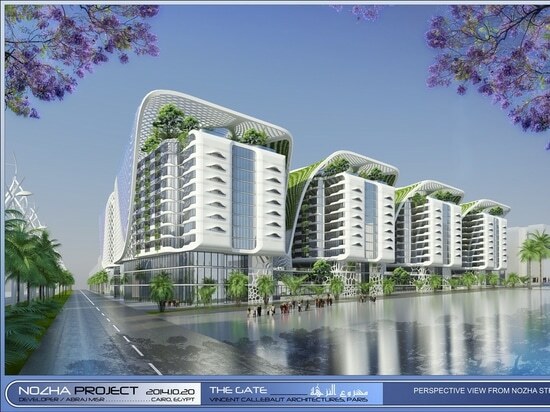 The Gate project is the just equilibrium between a very efficient distribution of 1000 apartments and a very contemporary and sustainable identity. 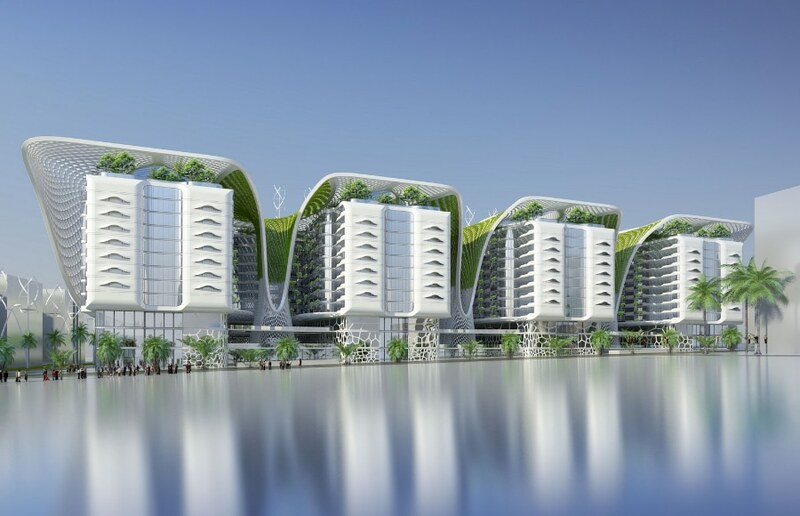 This project will be the new symbol of the construction of a smart building in the heart of New Cairo, right symbiosis between the high quality of life and the respect of the environment. Consequently, the Gate project is eco-designed according to the bioclimatic rules (solar cycle, prevailing wind directions, endemic plant species, etc.) on the one hand, and by the integration of renewable energies (wind turbines, thermal solar energy, photovoltaic solar energy, geothermal energy, biomass, etc.) on the other hand. 1. The Windcatchers transformed into mega trees in the middle of each green patios. 2. The Passive Geothermal Cooling System integrated along each core with the vertical shafts. 3. The Solar Photovoltaic Cells covering all the solar roof and the west and east facades. 4. The Solar Heater Tubes located on the roof above each core. 5. The Wind Turbines integrated along the axial spine at both ends of the Promenade. 6. The Roof Food Gardens covering the whole complex improving the thermal inertia of the roof. 7. The Living Walls growing along the 9 Megatrees and the Fogger system for the automatic watering refreshing the atmosphere. 8. The use of Recyclable and/or Recycled Furniture (Cradle to Cradle) recommended to the future residents in order to decrease their carbon footprint. The windcatchers are known in traditional Egyptian architecture in Ancient Egypt as demonstrated in Windcatchers on the Pharonic house of Neb-Ammun, Egypt, 19th Dynasty, British Museum. It was revived in Neo-islamic architecture as the works of Hassan Fathy. In Egypt the windcatchers are known as "Malqaf". The windcatcher can function in three ways: directing airflow downward using direct wind entry, directing airflow upwards using a wind-assisted temperature gradient, or directing airflow upwards using a solar-assisted temperature gradient. The 9 megatrees are in fact 9 big windcatchers and the potential benefits regarding this natural passive cooling system may include: - Improved passive cooling during warm season (mostly on still, hot days) - Improved night cooling rates - Enhanced performance of thermal mass (cooling, cool storage) - Improved thermal comfort (improved air flow control, reduced draughts). 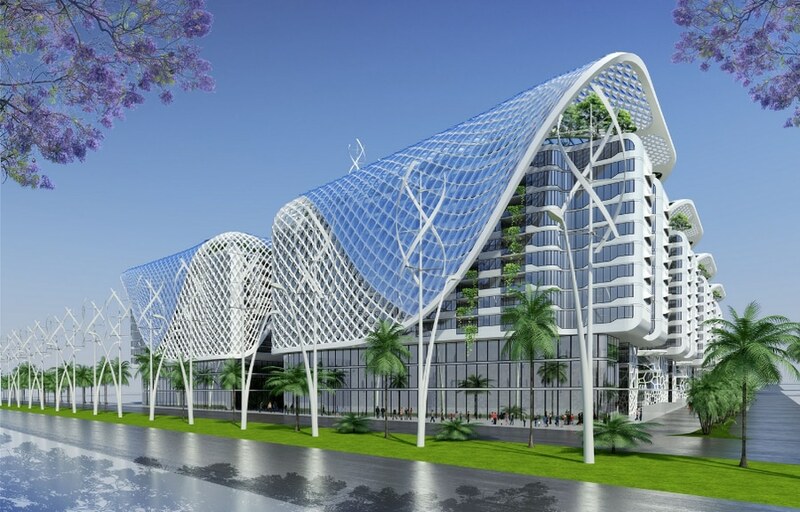 On this slide, you can see the structural model design of the megatrees with in the bottom part a glass cover to create the chimney effect from the shopping mall, and in the top part, the integration of green walls refreshing the atmosphere by the evapo-transpiration of plants. Passive Cooling is a building design approach that focuses on heat gain control and heat dissipation in a building in order to improve the indoor thermal comfort with low or nil energy consumption. This approach works either by preventing heat from entering the interior (heat gain prevention) or by removing heat from the building (natural cooling). Natural cooling uses on-site energy, available from the natural environment, combined with the architectural design of building components (e.g. building envelope), rather than mechanical systems to dissipate heat. A Canadian well can reduce the temperature by 5 to 8°C in each apartment during a heat wave using virtually no electricity. It passively uses geothermal energy, and is perfect to cool the apartments during the summer and to heat it in the winter. A Canadian well consists of passing a proportion of fresh air through pipes buried around 2 to 3 meters in the ground, below the foundations of the building, before it enters the housing. In the summer, conversely, the ground is cooler than the outside temperature: this clever “well” is going to use the ground freshness to temperate the air coming in the housing. In The Gate Project, we propose to integrate air shafts of 1 square meters along all the cores to refresh naturally each apartment. Using ground loops, the geothermal heat pumps enable to move heat energy back and forth between the building and the earth to provide an efficient and environmentally friendly method for heating and cooling apartments and commercial spaces, and even to help to provide hot water. 3. SOLAR PHOTOVOLTAICS CELLS Most conventional solar cells use visible and infrared light to generate electricity. In contrast, the innovative new solar cell also uses ultraviolet radiation. Used to replace conventional window glass, or placed over the glass, the installation surface area could be large, leading to potential uses that take advantage of the combined functions of power generation, lighting and temperature control. In the project, the solar roof will be covered by walkable solar panels creating shadows above the patios and the promenade and generating in situ a big part of the electricity necessary for the building. The solar cells will be integrated in a double glass layer easy to clean. Solar water heating or solar hot water systems comprise several innovations and many mature renewable energy technologies that have been well established for many years. Solar water heating systems are designed to deliver hot water in all the bathrooms and kitchens of the building for most of the year. Glass-metal tubes collecting the warm of the sun and heating the water will be integrated in the elliptical shapes covering the mechanical rooms in each core on the roof. Vertical-axis wind turbines are a type of wind turbine where the main rotor shaft is set vertically and the main components are located at the base of the turbine. This arrangement allows the generator and gearbox to be located close to the ground, facilitating service and repair. Major drawbacks for the early designs (Savonius, Darrieus and giromill) included the significant torque variation during each revolution, and the huge bending moments on the blades. Later designs solved the torque issue by providing helical twist in the blades. These helical twisted wind turbines are located in the project along the inner street on the roof in order to benefit of the prevailing winds and generate a maximum of electricity.Along the Nozha Street, we propose to develop for the City a new energetically self-sufficient prototype « The Phylolight », new hybridization between an urban light and vertical wind turbines. Community gardens provide fresh produces and plants as well as satisfying labor, neighborhood improvement, sense of community and connection to the environment. Community gardens may help alleviate one effect of climate change, which is expected to cause a global decline in agricultural output, making fresh produce increasingly unaffordable. Community gardens improve users’ health through increased fresh vegetable consumption and providing a venue for exercise.The gardens also fight against two forms of alienation that plague modern urban life, by bringing urban gardeners closer in touch with the source of their food, and by breaking down isolation creating then a social community. In the Gate project, we propose thus to transform the roof into a new innovation place for the social life of all the residents of the project. This big garden in the sky will integrate playgrounds for the children, sports areas, food gardens and orchards. 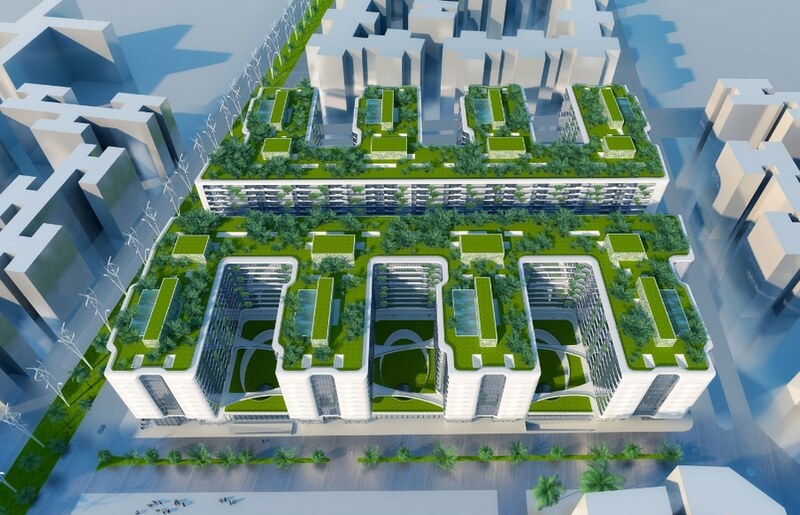 This green roof will compensate the high density of the construction and will be a perfect insulation coat above the residential levels to reduce the urban warming. The primary cause of heat build-up in cities is insolation, the absorption of solar radiation by roads and buildings in the city and the storage of this heat in the building material and its subsequent re-radiation. The green walls enable to reduce overall temperatures of the building. Effectively, plant surfaces, as a result of transpiration, decrease more than 4–5 °C below the ambient.Living walls may also be a means for water reuse. The plants may purify slightly polluted water (such as greywater) by absorbing the dissolved nutrients. Bacteria mineralize the organic components to make them available to the plants. They are also suitable in arid areas, as the circulating water on a vertical wall is less likely to evaporate than in horizontal gardens. In the project, the 9 megatrees will be covered by living walls. Along the inner street, the curtain walls will be punctuated by green walls to design the main entrances towards each housing blocks. 8. SMART HOME – HOME AUTOMATION The user interfaces enable to control the different zones/ rooms/temperature (heating&cooling) control /lighting control/ Ventilation control. Multi-sensors are used to detectnumber of persons in the room, motion, temperature, and light level (Day/Night). Natural HVAC automation enable to reachperfectclimate. Using automation application to control the requiredtemperaturebeforereachingyour home whilesavingelectricity. In conclusion, by respecting the bioclimatic rules and thanks to the integration of renewable energies, the project aims at reducing progressively the demand in mechanical ventilation and artificial lighting by increasing everywhere in the project the natural ventilation systems and the natural lighting systems. The leitmotiv of «Gate Residence» is to transform the city into an ecosystem, to transform the district into a forest.